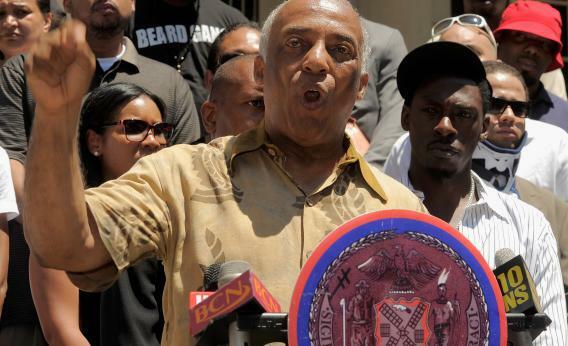 NEW YORK, NY - JULY 05: New York City Council member Charles Barron speaks during The Monumental 5 Press Conference on the steps of New York City Hall on July 5, 2011 in New York City. The Monumental 5 are 5 individuals who are reported to have been victims of police brutality at a record release party for Hip Hop artist Pete Rock and General Steele on Tuesday June 28, 2011. Two major city public worker unions, District Councils 37 and 1707 of the giant American Federation of State, County, and Municipal Employees, have already endorsed Barron against Assemblyman Hakeem Jeffries, a relatively moderate legislator who has championed charter schools, a union bugaboo. And BuzzFeed has learned that their powerful federal parent union, known as AFSCME, is planning to dive into the race on Barron’s behalf. Another key New York State public workers union, the Civil Service Employees Association, meanwhile, blocked an AFL-CIO effort to endorse Barron’s rival. “We respect the voice of our members,” AFSCME spokesman Chris Policano told BuzzFeed. “With the unanimous endorsement of the three affiliates, there will be money spent in this race. Even as public sector unions remain on the defensive nationally in the wake of a stinging rebuke in the Wisconsin recall, we shouldn’t be surprised they’re going with the more economically populist (if also outrageous) candidate in this local race. New York City unions were actively involved in the Occupy Wall Street movement, and have been frustrated by a relatively hostile Democratic Governor in Andrew Cuomo.